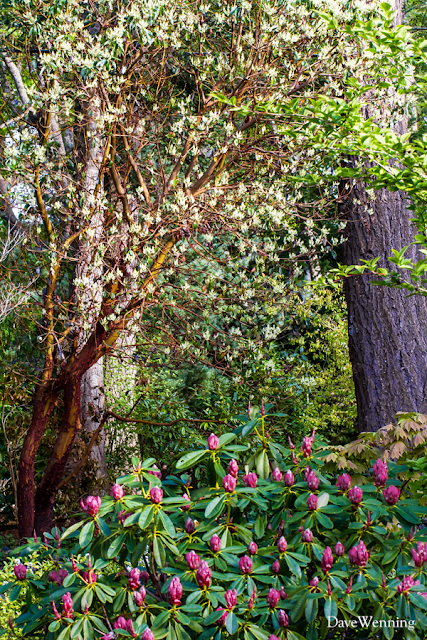 This is one of the native Madrona trees (Arbutus menziesii) in my yard and it is blooming like crazy. I don't recall ever seeing this tree bloom before. As I drive around the area, I am seeing Madronas blooming profusely everywhere. Along the Highway 20 corridor into Anacortes, the trees are revealed as giant clouds of white blossoms all along the roadway. I had never realized how many Madronas were growing there. These are special trees to Pacific Northwesterners, and this year, they are really putting on a show for us. 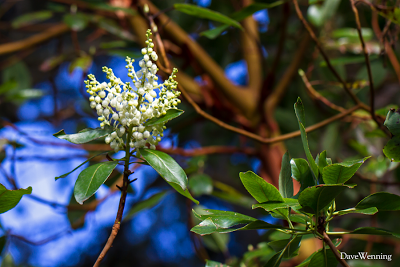 The Madrona (also called Madrone and Arbutus) has been correctly described as one of Nature's works of art. The 'Lem's Cameo' Rhododendron in the foreground of the photo is a Madrona relative. The flowers are urn-shaped, very similar those on the Madrona's Heath family cousins Salal and Kinnikinnick. 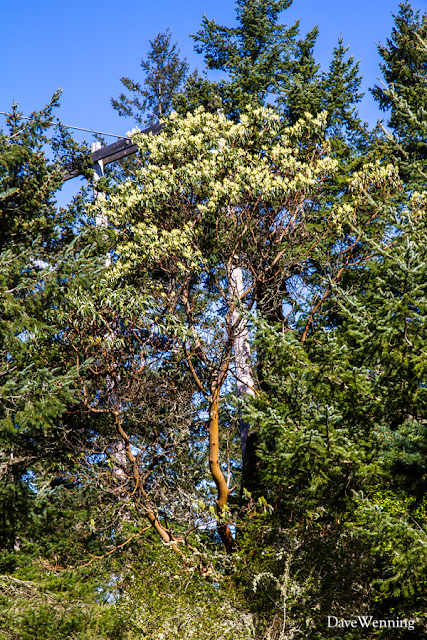 On the Madrona, the flowers are arranged on a Christmas tree-like structure at the branch tips. The flowers will produce sprays of berry-like fruits relished by birds. The fruits give rise to one of its common names, Strawberry Tree. Like rhododendrons, new branches will sprout below the flowers. This Madrona is growing at the summit of Goose Rock in Deception Pass State Park nearby. Even on the warmest days, the trunks of Madronas will feel cool to the touch. "Pitch used to go fishing before the sun rose, and then return to the shade before it became strong. One day he was late and had just reached the beach when he melted. Other people rushed to share him. Douglas Fir arrived first and secured most of the pitch. Grand Fir obtained only a little; and by the time Arbutus arrived there was none left. Therefore, Arbutus has no pitch to this day." "Chief Phillip Paul of the Saanich tells how Arbutus was the tree used by the survivors of the Great Flood (a tradition common to almost all Northwest Coast peoples) to anchor their canoe to the top of Mount Newton. To this day, the Saanich people do not burn Arbutus in their stoves, because of the important service this tree provided long ago."